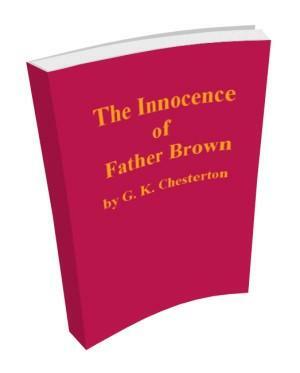 The Innocence of Father Brown is a collection of classic short stories by G. K. Chesterton. Start reading here then download the free eBook (free pdf). Between the silver ribbon of morning and the green glittering ribbon of sea, the boat touched Harwich and let loose a swarm of folk like flies, among whom the man we must follow was by no means conspicuous–nor wished to be. There was nothing notable about him, except a slight contrast between the holiday gaiety of his clothes and the official gravity of his face. His clothes included a slight, pale grey jacket, a white waistcoat, and a silver straw hat with a grey-blue ribbon. His lean face was dark by contrast, and ended in a curt black beard that looked Spanish and suggested an Elizabethan ruff. He was smoking a cigarette with the seriousness of an idler. There was nothing about him to indicate the fact that the grey jacket covered a loaded revolver, that the white waistcoat covered a police card, or that the straw hat covered one of the most powerful intellects in Europe. For this was Valentin himself, the head of the Paris police and the most famous investigator of the world; and he was coming from Brussels to London to make the greatest arrest of the century.